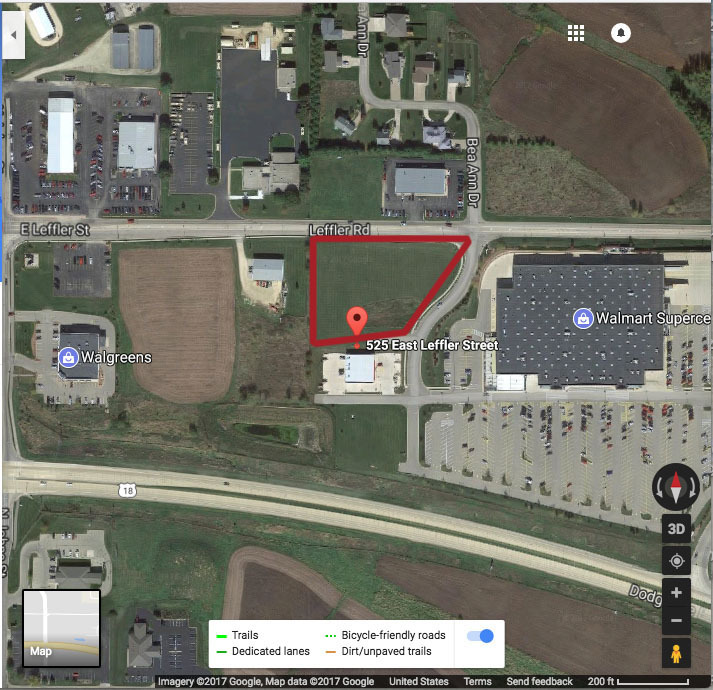 1 Acre Lot off Hwy 18 — Smith Bowden, Inc.
Prime one-acre commercial lot with Highway 18 visibility. Fully improved with utilities and water laterals to lot line, curb and gutter. Near Walmart Superstore and Walgreens. Will sell or build to suit. Curb/gutter. Natural gas, electric to lot. Great location for outlet store, bank, fast food or franchise business! Dodgeville is a classic slice of Small Town America, with its charming historic downtown district and a small, growing community of just under 5,000. Ideally located midway between Madison and Dubuque, thousands of visitors from around the world flock to the area each year. Among the natural attractions is Governor Dodge State Park with its serene waterfalls, lakes and caverns. Arguably the area's most unique attraction could be the House-on-the-Rock with its amazing one-of-a-kind collections ranging from carousels to calliopes and everything in between. Just minutes away is the nationally acclaimed American Players Theater where patrons experience world class performances under the stars often accompanied by the sound the resident whippoorwills. The area is known for its arts community, with the likes of nearby Frank Lloyd Wright's Taliesin, dozens of select local artists open their studios each year for the Driftless Fall Art Tour. With its vibrant tourist attractions and growing community, Dodgeville business community is thriving. It is home to the corporate headquarters of Land's End, as well a thriving business community with both new and old businesses including great restaurants. And. . .. Being a good ol' Wisconsin small town, Dodgeville boasts its annual Grill Cheese Championship! Located near Walmart Super Store and Walgreens. Take Hwy 18W to Leffler Rd.